By Perry McLimore, MD., JD. Gamekeeper’s thumb was described in 1955 due to chronic laxity found in the joint in Scottish gamekeepers.1 The gamekeepers would break the necks of small game by placing the neck of the animal between the ground and their thumbs. Skier’s thumb is the same injury, but it occurs acutely when a skier falls on his or her ski pole. The damage is also seen acutely in volleyball and football players. 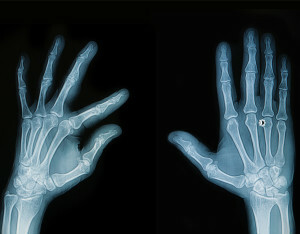 The first metacarpophalangeal (MCP) joint is at the base of the thumb. The joint consists of the first metacarpal of the hand and the proximal phalanx of the thumb.The ulnar collateral ligament (UCL) provides stabilization of the first MCP joint. The UCL connects the metacarpal to the proximal phalanx of the thumb. There is a proper ligament of the UCL and an accessory ligament. The adductor pollicis muscle also contributes to the stability of the MCP or thumb joint. The muscle expands to form the adductor aponeurosis, which lies superficial to the UCL. An aponeurosis is a sheet of fibrous connective tissue that extends from a muscle. A gamekeeper’s or skier’s thumb consists of a partial or complete tear of the UCL. Such disruption can occur over time (gamekeepers) or suddenly (skiers).An acute injury happens from a sudden abduction (lateral) stress of the thumb happens as when falling on an outstretched hand. The UCL may be partial torn or completely ruptured.2 An avulsion fracture of the proximal phalanx or, less commonly, the metacarpal bone may be present. hand in a short arm thumb spica cast or splint for 4 to 6 weeks. Type II, type IV, and type VI needs surgical intervention. Basically, partial tears of the UCL and non-displaced avulsion fractures can be successfully treated with a cast or splint.8Complete tears of the UCL, with or without a Stener injury, and displaced fractures require surgery. Campbell C. “Gamekeeper’s Thumb.” J Bone Joint Surg Br, 37-B (1):148-149, 1955. Peterson J, Bancroft L. “Injuries of the Fingers and Thumb in the Athlete.” Clin Sports Med, 25(3):527-542, 2006. Stener B. “Displacement of the Ruptured Ulna Collateral Ligament of the Metacarpophalangeal Joint.” J Bone Joint Surg Am, 44B (4):869-879, 1962. Newland C. “Gamekeeper’s Thumb.” Clin Sports Med, 25(3): 41-48, 1992. Fricker R, Hintermann B. “Skier’s Thumb: Treatment, Prevention, and Recommendations.” Sports Med, 19(1): 73-79, 1995. Plancher K, et al. “Role of MR Imaging in the Management of “Skier’s Thumb” Injuries.” MagnReson Imaging Clin N Am, 7(1): 73-84, 1999. Chuter G, Muwanda C. “Ulnar Collateral Ligament Injuries of the Thumb: 10 Years of Surgical Experience.” Injury, 40(6): 652-656, 2009. Demirel M, Turhan E, Dereboy F, et al. “Surgical Treatment of Skier’s Thumb Injuries: Case Report and Review of the Literature.”Mt Sinai J Med, 73(5): 818-821, 2006. 3 Responses to "Gamekeeper’s Thumb"